Before I began posting on the Weekly Challenge, my photographs remained in their digital library, gathering electronic dust. The photo challenge, with the encouragement and suggestions of another photographer, inspire me to go back and take a second look at photos that never made it on a blog page. The challenge also provides an opportunity to view other photographer’s interpretation of the theme, which help to form new artistic approaches to taking pictures. The challenge presents the incentive to look for a photographic opportunity to fit the theme. 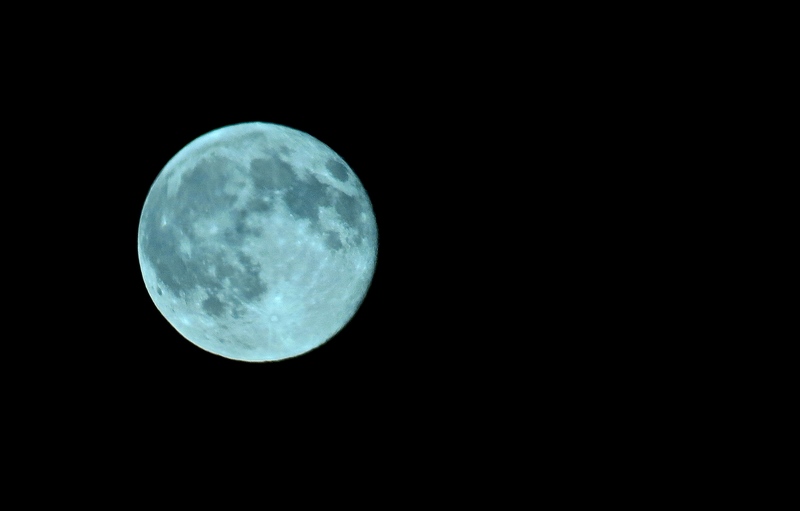 Once in a blue moon, I take a photograph of the blue moon, July 31, 2015. Wow, you managed to capture the tint. When I looked at the moon that night, but it was its normal yellow color. Was an experiment, as I used the manual setting, which converted the color to a blue tint. Right! I have dozens of moon pictures, and still drive out to the country to get another shot of the moon coming over the horizon. Thanks for stopping by. Look up at the moon now! The moon is looking really handsome tonight! I have to agree with you on photos gathering electronic dust. I actually just took the dust off of my camera to start snapping pics ☺ Loved this picture! The theme actually helps to look at photos in new light. Thanks for stopping by. I agree. I also have a lot of bad pictures that I keep for…what exactly I do not know. I am curious to know if you hang on to yours too? That’s a good question. As the library grows, junk photos can take up space and time sorting through. So the obviously unusable pictures, I delete. On the other hand, never know when can take a section of a picture or reformat in some way to make a better photo. Those I keep.